Mitch Stockridge (Dennis Friebe) is a successful author whose works have help many people across the globe. With every interview he does and any fan he meets he’s always asked the same question, “How do you come up with your brilliant ideas?” Mitch is hiding a secret in his upstairs bathroom. It’s a secret of monstrous proportions. Feed the monster and it’ll reward you with a brilliant idea. The only problem is that this monster has a taste for human blood. 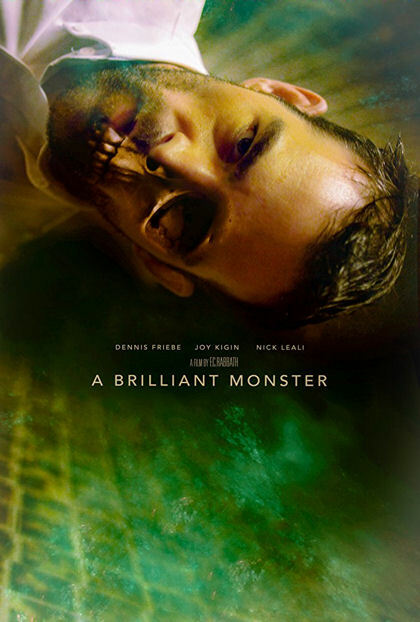 This low budget indie thriller is a study of the societal pressures to succeed previous accomplishments. Explore the depths one man will go to for success, the lengths he’ll go to stay on top and the thin line between sane and insanity. This film heavily relies on the performance of its main actor Dennis Friebe and I have to say he delivers. Mitch is a likeable enough guy that you’ll grow to loath for the despicable things he does. So why is this movie so brilliant? Director F.C. Rabbath creates a simplistically layered tale that will walk you into the mouth of madness, leaving the viewer guessing the meaning behind it. Production values are low but the movie is better for it. Rabbath crafts a slow paced horror film that’s a throwback to the unseen killers of the 70’s and 80’s. Sure I would have liked to see more of the kills but you couldn’t have the payoff at the end which is worth it. So what’s the ending? It’s one of the film’s finest selling points. It’s A Brilliant Monster. So come on up to the bathroom and see what I left inside. All it takes is a little push and you’ll go right in.